The University Endowment Lands (UEL) is a separate jurisdiction from the City of Vancouver and the University of British Columbia (UBC). 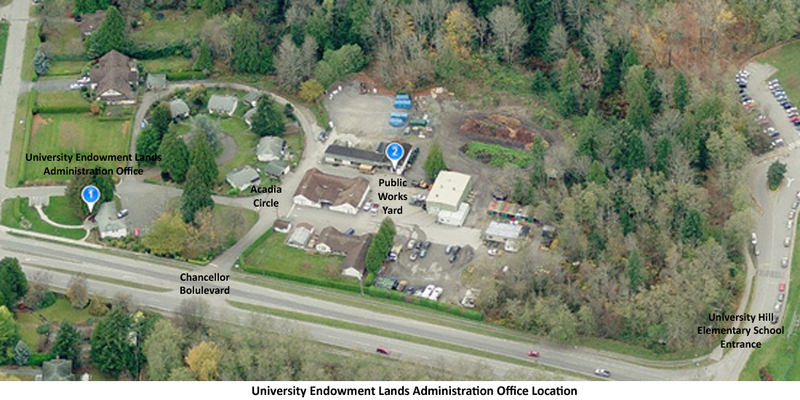 appoint a person to administer the University Endowment Lands. The Minister of Community, Sport and Cultural Development appoints a Manager who is responsible for the day-to-day administration of the UEL. Decisions made by the UEL Administration and staff are guided by the Official Community Plan , and the Land Use, Building and Community Administration Bylaw (including all schedules and maps) . The UEL Administration sits on a provincially-owned site that includes the administration building, works yard, five residential cottages, and the UEL Heritage Firehall. Local staff, provincial employees all, provide a range of administrative services, an important one of which is to process development and building permits. Staff also carry out the maintenance of UEL streets and public landscapes, garbage collection, water and sewer services, and a variety of other matters. For more information, you can visit the UEL Administration Website.